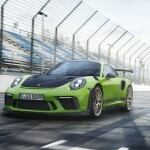 2019 Porsche 911 GT3 RS: What Can You Get Starting at $188,550? The 2019 Porsche 911 GT3 RS was just unveiled prior to the 2018 Geneva Motor Show. The pricing of the sports car starts at $188,550, and it promises more downforce, more power and better grip. 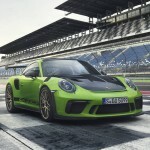 The Porsche 911 GT3 RS uses the same 4.0-liter naturally-aspirated flat-six engine used by the 911 GT3. However it has been slightly tuned to deliver 520 hp and 346 lb-ft or torque. The numbers are 20 hp and 7 lb-ft up from its non-RS sibling. The output of the 911 GT3 RS is distributed to the rear-wheels via a seven-speed PDK dual-clutch transmission—ditching the six-speed manual of the plain 911 GT3. The setup allows the RS to accelerate from zero to 60 mph in just three seconds. Then the top speed of the sports car is capped at 193 mph. The extra power of the 911 GT3 RS is complemented by the chassis derived from the 911 GT3. It includes Porsche Active Suspension Management, Porsche Torque Vectoring Plus and rear steering. In addition, it comes with new helper springs located at the front axle. All these are partnered with a set of standard active dampers that help improve the grip of the vehicle. The 2019 Porsche 911 GT3 RS benefits from all the goodies found in the 911 GT3 but with a few tweaks to help improve its aero and design. Among the changes are the wider body, carbon fiber hood and fenders, magnesium roof, larger front lip spoiler and side skirts, huge fixed rear wing as well as the optional forged magnesium wheels from the Weissach Package. 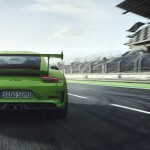 The new Porsche 911 GT3 RS only features two seats. The bucket seats come in carbon fiber shells. Aside from the other interior elements within the 911 GT3, the RS model also boasts lightweight glass and reduced sound insulation.